Mauritian Premier Pravind Jugnauth, who is the chief guest for the three-day event, also spoke on the occasion. Prime Minister Narendra Modi on Tuesday launched a scathing attack on the Congress over corruption using former chief minister Rajiv Gandhi’s remark that only 15 per cent of what is released from the Centre reaches the villages. Referring to Gandhi’s comment that only 15 paise of a rupee reaches the masses, PM Modi said the Congress government had done nothing to stop the leakage.”You must have heard of an ex-prime minister talking of corruption. He said only 15 per cent of a rupee from Delhi reaches villages and that 85 paise disappears. For so many years, the party that ruled the country accepted this,” he said. 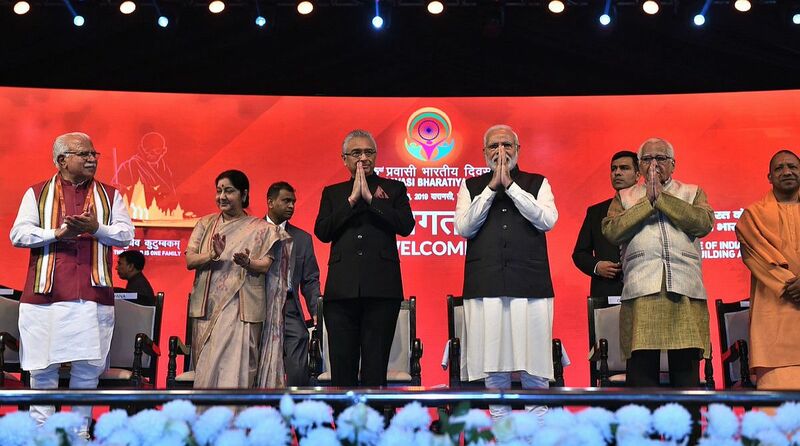 “…Yet, in the following 10-15 years of its rule, there was no attempt to curb the loot and plug the leakage of public money,” PM Modi said after inaugurating the 15th Pravasi Bharatiya Divas (PBD) 2019 in his parliamentary constituency of Varanasi. “The party that ruled for so long and the system that it built for the governance of the country, the then prime minister admitted the problem. They diagonsed the ailment but did not treat the illness. Even in the 10-15 years of rule thereafter, they did not try to plug the pilferage of 85 per cent of resources,” he added. Addressing the Non-Resident Indians at the event, Modi claimed that in the past four-and-a-half years, his government has given around Rs 5,78,000 crore directly to the people through various schemes and have transferred it to their bank accounts. The prime minister added that his government had stepped in to rectify the situation. The “85 per cent loot” taking place during the Congress regime had been plugged “100 per cent” through technology, he said. He further described the NRIs as the country’s brand ambassadors and said they were the symbols of the country”s capabilities. “People of Indian origin are in leadership roles in countries such as Mauritius, Portugal and Ireland,” he said. Continuing his tirade against the opposition, he said efforts to stop the “leakage” could have been made earlier as well but there was no intention and will power. Meanwhile, PM Modi said work is on to issue chip-based e-passports to Indian citizens under a centralized passport system. He hailed the prime minister for India’s transformation through initiatives such as the Skill India and the Beti Bachao Beti Padhao schemes. He also praised Modi’s global stewardship in promoting clean energy and for setting up the International Solar Alliance. Jugnauth announced that his country will hold a Bhagwad Gita Mahotsav next month and a Bhojpuri Festival next year. The theme of this year’s convention is ‘Role of Indian diaspora in building new India’.